Bonnie is a new open source software tool that MITRE has developed and released in April 2014 that allows Meaningful Use (MU) Clinical Quality Measure (CQM) developers to test and verify the behavior of their CQM logic. The goal of Bonnie is to reduce the number of defects in CQMs by providing a robust and automated testing framework. Bonnie allows measure developers to independently load measures that they have constructed using the Measure Authoring Tool (MAT). Loading the measures into Bonnie converts the measures from their Extensible Markup Language (XML) eSpecifications into executable artifacts and measure metadata. The measure eSpecification format that Bonnie loads is Health Quality Measure Format (HQMF) XML. The HQMF specification provides the metadata and logic that describe the specifics of calculating a CQM. Bonnie can load the HQMF describing a measure and programmatically convert the HQMF specification into an executable format that allows calculating the measure directly from the specification. The measure metadata loaded into Bonnie is then used to allow developers to rapidly build a synthetic patient test deck for the measure using the clinical elements defined during the measure construction process. By using measure metadata as a basis for building synthetic patients, developers can rapidly and efficiently create a test deck for a measure. Once a CQM has been loaded into Bonnie, a user can inspect the measure logic and then build synthetic test records and set expectations on how those test records will calculate against a measure. This capability to build synthetic test patient records, set expectations against those records, and calculate the measures using those patient records provides an automated and efficient testing framework for CQMs. Using the Bonnie-supported CQM testing framework allows measure developers to more clearly understand the behavior of the measure logic, validate that the measure logic encodes their intent, and allows for multiple iterations of measure updates to be validated against a test deck. Additionally, the development of a test deck as part of measure development provides benefits after the measures are finalized. The test deck build as part of measure development can be used to demonstrate the intent of the measure though the use of patient examples included in the test deck. Furthermore, the test deck provides systems that implement the measures with a means to validate the development of their systems. This is provided in the form of a base set of synthetic patient records with known expectations for calculating against the implemented measures. Finally, the test deck could be used as a basis for the test deck used as part of the Meaningful Use certification program. Bonnie has been designed to integrate with the nationally recognized data standards used by the Meaningful Use program for expressing CQM logic for machine-to-machine interoperability. This provides enormous value to the CQM program and federal policy leaders and stakeholders: this software tool verifies that the new and evolving standards for the Meaningful Use CQM program are tractable and can be implemented in software. 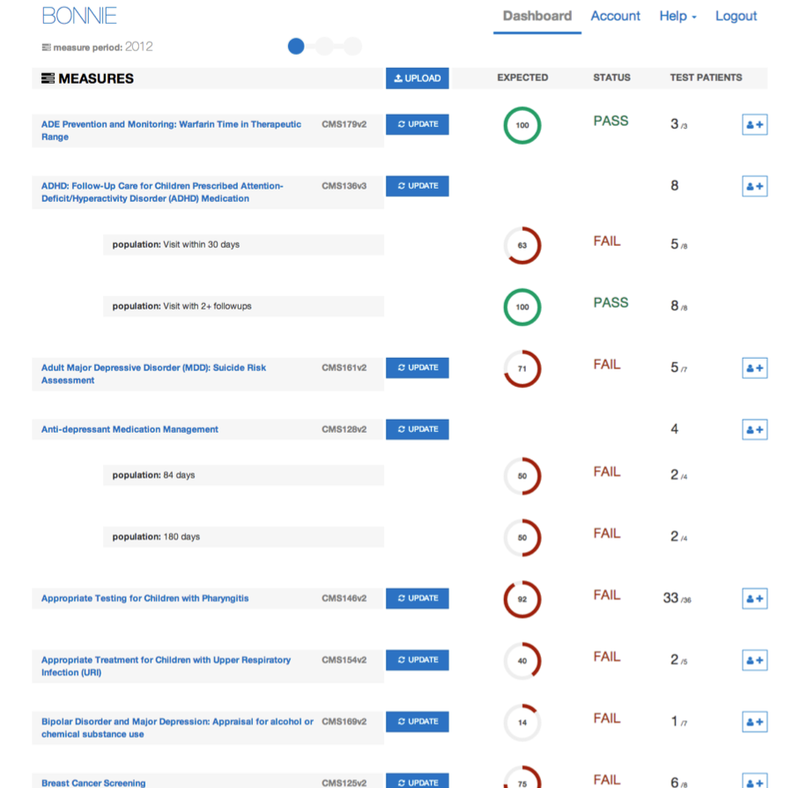 Additionally, Bonnie was designed to provide an intuitive and easy-to-use interface based on feedback from the broader measure developer community. 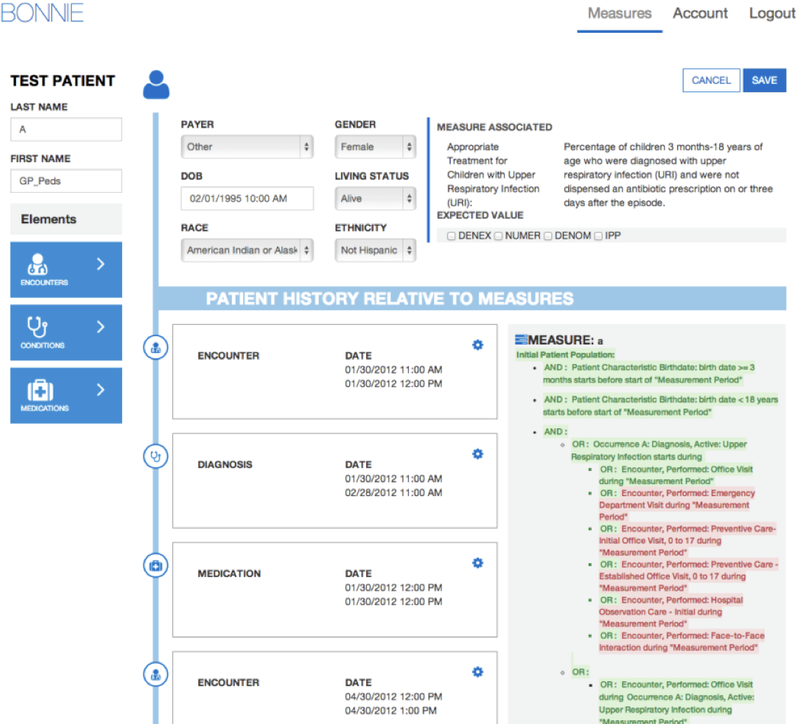 A key goal of the Bonnie application is to deliver a user experience that provides an efficient and intuitive method for constructing synthetic patient records for testing and validating CQMs. The Bonnie software is freely available via an Apache 2.0 open source license. The Meaningful Use program makes all or parts of the Bonnie software available for inspection, verification, and even reuse by other government programs or federal contractors.